Chic, slim and lightweight, this pocket-sized printer is the perfect accessory for your mobile device, wherever you go! Instantly print and share your memories. Completely portable, Canon Zoemini can slip into pockets or small bags for instant printing to capture those magic moments, wherever you are! Make your photos your own with the Canon Mini Print app's on-trend filters, AR, frames and doodles, or use the tiling feature to make a standout poster from smaller snaps. Use the tiling feature to create a standout poster with either 4 or 9 prints. Link up your tablet or mobile phone to Canon Zoemini via Bluetooth® for instant printing of photos and social media snaps - it's completely fuss-free! Print stylish smudge-proof, tear-proof and water-resistant 2x3 inch photos, ideal for sharing or personal keepsakes. Free photos from stuffy, boring frames - peel off the backing to reveal the sticky side and attach to walls, laptops and cases to keep your memories close. 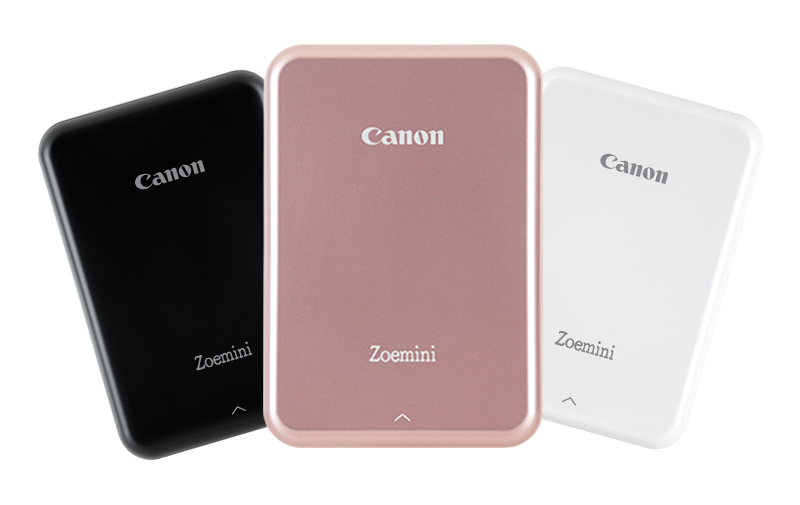 *Disclaimer: Requires mobile device to be connected to the Canon Zoemini via Bluetooth® and the Canon Mini Print App, available for free on the App Store and at Google Play. Compatible with mobile devices running iOS 9.0 or later, and Android devices running Android 4.4 or later.